May 5, 2015 - “Are you proud of where you work?” According to the Great Place to Work® Institute, RBC employees are. Overwhelmingly, RBCers participating in the Best Workplaces study affirmed they are proud to tell others where they work. This is just one way we know employees value being part of the RBC team and are committed to our mutual success. We’re honoured that RBC has been selected as one of Canada’s Top Employers for Young People by Mediacorp Canada Inc. in its annual survey of Canadian businesses and for being recognized as one of the nation’s leaders when it comes to attracting and retaining younger workers. 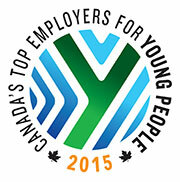 For the full list of Canada’s Top Employers for Young People for 2015 and the editors’ detailed reasons for selecting each winner, visit: www.canadasTop100.com/young_people.